Executive's Guide to Fair Value Profiting from the New Valuation Rules | Free eBooks Download - EBOOKEE! "The advent of fair value reporting is not your Momma's (or your Papa's) kind of accounting. If you're a financial professional above the age of twenty-five who is working in industry, read this book. From choosing a fair value specialist to the perils of 'made as instructed' valuations to purchase price allocations to impairment testing to that SEC tripwire, customer relationships, fair value expert Al King gets it right. And he does so with neither jargon nor literary anesthesia. As a former CFO myself, all I can say is WOW!" Executive's Guide to Fair Value: Profiting from the New Valuation Rules brings senior level executives up to speed on what fair value really means. This new book addresses a full range of issues facing auditors and executives, including litigation and the "true" determination of value, estimating the value of working capital, and how to estimate the value and life of intangible assets. 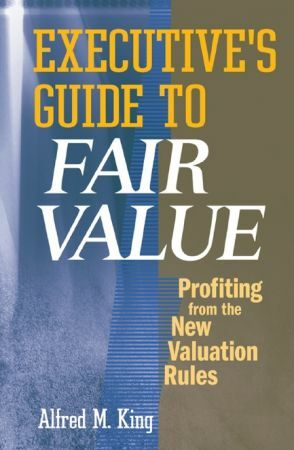 In basic, nontechnical language, Executive's Guide to Fair Value: Profiting from the New Valuation Rules will help all financial executives and auditors succeed in understanding the new fair value accounting rules that corporations must now follow. The result is a resource that professionals can rely on to understand the importance of valuation and the concepts that define it. No comments for "Executive's Guide to Fair Value Profiting from the New Valuation Rules".